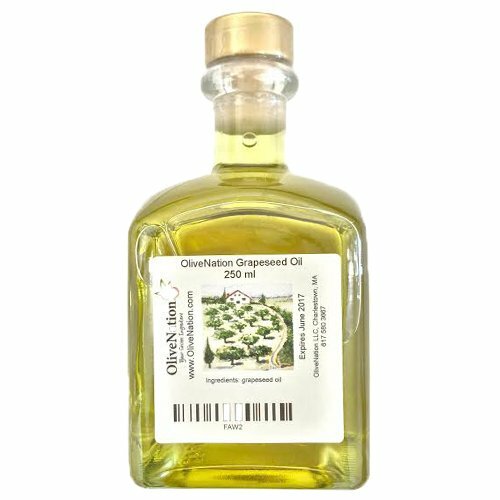 Grapeseed Oil by OliveNation features a green color and light flavor. With a 450-degree F smoke point, it's suitable for a variety of high-heat cooking and baking applications, including frying and roasting. Grapeseed Oil's light taste doesn't overpower other flavors, so it works well combined with stronger-flavored oils, like extra virgin olive. In addition to cooking with it, you can drizzle it on salads, roasted vegetables, fruit, and more. Grapeseed Oil's subtly nutty flavor works well in citrusy vinaigrettes. This natural oil is a common substitute for butter and canola oil. Good for healthy cooking, Grapeseed Oil contains linoleic acid. It has other benefits, too -- Grapeseed Oil makes a great skin moisturizer. How is it Made? The grape seeds that are leftover from winemaking are dried and then crushed by machine. Then, the oil is expeller pressed. This natural oil is free of chemicals. Storage Store in a cool, dry place. Don't store in the refrigerator. What is the Shelf Life? Unopened, the oil has a 24-month shelf life. Once opened, use within 6 months. Grapeseed Oil by OliveNation features a green color and light flavor. With a 450-degree F smoke point, it's suitable for a variety of high-heat cooking and baking applications, including frying and roasting. Grapeseed Oil's light taste doesn't overpower other flavors, so it works well combined with stronger-flavored oils, like extra virgin olive. In addition to cooking with it, you can drizzle it on salads, roasted vegetables, fruit, and more. Grapeseed Oil's subtly nutty flavor works well in citrusy vinaigrettes.